Positioned at the end of a curving driveway, villa UJV 303, also known as Villa Datcha, is a lovely, contemporary vacation retreat offering three uniquely decorated bedrooms. The indoor and outdoor living and dining spaces, including the well-equipped galley kitchen with pass-through bar, are casual and comfortable - and make for "easy living". The living room with guest bath has a sundeck and opens to the covered terrace and wonderful view. Various stairways lead down to the three (equally sized) bedrooms. All feature king/twin beds with ensuite baths, and views to the sea. 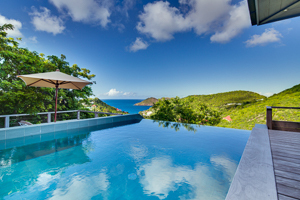 Villa UJV 303 is close to gorgeous Flamands Beach and is a great choice for three couples. 2 minutes - Flamands Beach.